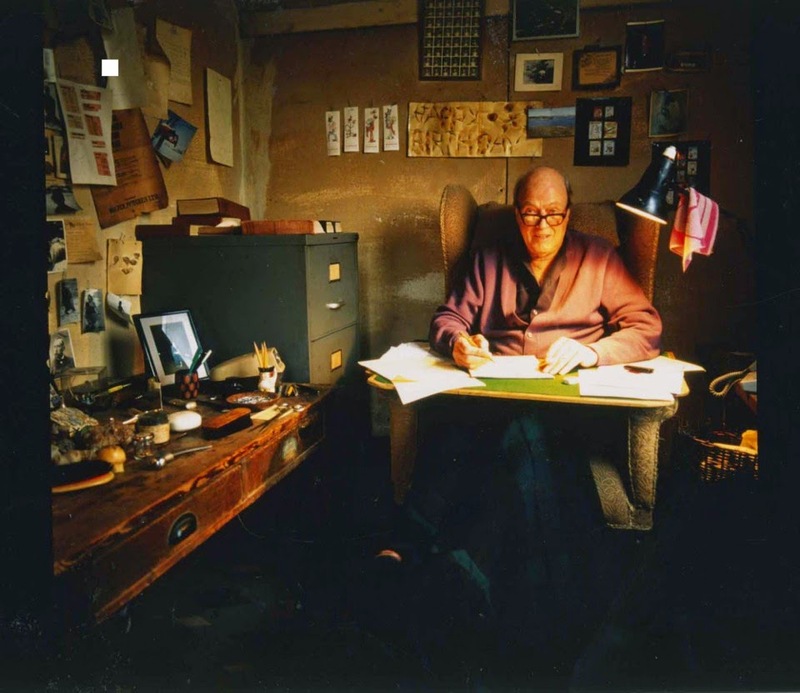 As part of our celebrations for the fiftieth birthday of Charlie and Chocolate Factory, Sandra Greaves takes a peek into Roald Dahl’s famous writing hut. The places where writers write are often intriguing. 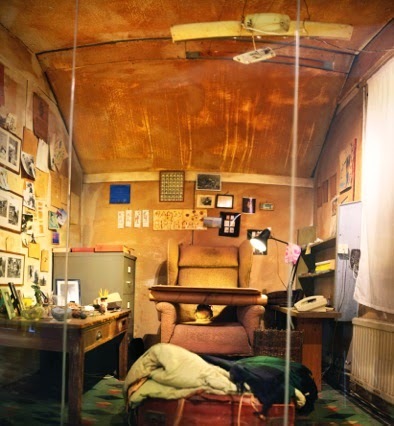 Roald Dahl’s writing hut is downright irresistible. With two tiny rooms, it was only just big enough for the 6ft 5’ giant of a man and a handful of furniture. Yet it was his workplace for 30 years. Dahl adored his hut and wrote in its back room for four hours every day – two in the morning before lunch (Norwegian prawns, half a lettuce and a Kit Kat) and two following his afternoon nap. ‘When I am in this little place, it’s lovely, and you can lose yourself in your work,’ he said. ‘It is my little nest, my womb.’ A former fighter pilot, he also compared it to the cockpit of a Hurricane – a place where his mind had the freedom to soar. The front room stored Dahl’s papers in two wooden cabinets, one of them with a grisly handle made out of a steel prosthesis from an unsuccessful hip operation. The front room stored Dahl’s papers in two wooden cabinets, one of them with a grisly handle made out of a steel prosthesis from an unsuccessful hip operation. In the back room, Dahl kept his favourite pencils, his lined yellow US legal pads for writing, and a ‘cabinet of curiosities’ that included shavings of his spine floating in a glass vial, fragments of Babylonian pottery and a metal ball he had made out of the wrappers of hundreds of chocolate bars. Donald Sturrock describes everything as ‘yellow with nicotine and reeking of tobacco’, with ‘a carpet of pencil sharpenings and cigarette ash’ covering the linoleum floor. Mostly Dahl was left to himself in his hut. He discouraged the children from visiting by telling them it was inhabited by wolves, though his granddaughter, Sophie Dahl, remembers occasionally being allowed to bring him a gin and tonic and stand outside on the step as he drank it. There were other visitors too – in the early days of the hut, Dahl described the cows ‘licking the windowpanes from time to time and eating the curtains if the windows were open’. Amazingly, it’s all still there. After Dahl’s death in 1990, the hut was saved for new generations of fans and reconstructed in the nearby Roald Dahl Museum and Story Centre in Great Missenden. You can see it online or in its wood and polystyrene flesh - including cigarette butts in the ashtray and Dahl’s beloved ball of chocolate wrappers. 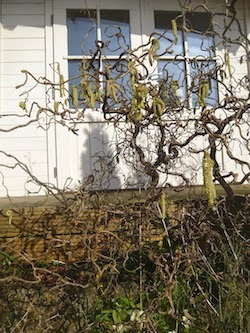 How whizzpoppingly awesome is that? So what does Lesley think about fellow shed writers? Since moving to The Shed, Lesley has extracted her WIPs from the writhing clutter of the kitchen table, and they are so grateful to be rescued, they are practically writing themselves. She’s hoping they’ll edit and submit themselves too while they’re about it. Read her blog here. 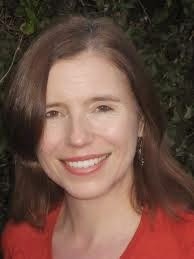 Sandra Greaves is one of the winners of SCBWI’s Undiscovered Voices 2012. Her first novel, The Skull in the Wood, was nominated for the Waterstones Children’s Book Prize 2014. Lovely post, Sandra. Thank you. And Lesley, you have a shed too!! Loved this evocative article. Thank you. Wonderful, Sandra. Den-building now another form of procrastination to put on the list. Lesley, love your magical space, too. I love sharing a page with Roald Dahl, so thank you Sandra for such an interesting feature! Dens are great and every writer should have one. If you don't have a shed or even a garden, construct your den in a corner of a room with the traditional clothes horse and drapes - but be warned, resident or visiting children will want to use it!